Last month brought two splendid, nearly 30-month-old steers through the cutting room for the fall harvest. Our freezers were filled with glorious, full-flavored, prime beef. And I mean prime. Incredibly, there are still folks who assume beef cannot marble without the aid of grain fattening. Balderdash, I say! The steaks coming out of the cutting room throughout the late fall have been deeply marbled and rich in flavor. Typically, early December in the Northeast has many customers leaving steaks off their shopping lists in favor of stew meat and roasts. But those who pause over our beef display just long enough to notice the marbling seize upon the rib eyes and porterhouses…for beef that approaches 30 months in age results in grassfed steak that is truly magnificent. The trick is to know how to handle it properly, whether you are cooking it indoors or outside. The simplest, most commonly heard distinction made between grassfed and factory-farmed meat is that grassfed is leaner. As we’ve just seen, that is not always the case. The real difference lies in the fact that, by virtue of a beef animal’s active and healthy life, there is true muscle integrity in the meat. This is wildly different from feedlot animals, which get little or no exercise, resulting in more flaccid (and hence less flavorful) cuts. This does not mean that grassfed steaks are less tender—on the contrary. Cooked more gently, grassfed meat is wonderfully tender. The healthy muscle texture does, however, mean that grassfed steaks will be more variable than grainfed meats. Taste and texture of steaks will vary based on breed, farming practices, pastures and individual animal characteristics. Thus, the trick to cooking a delicious steak is to work with the variability and take advantage of that beautiful muscle quality. We should be treating this meat as “tenderly” in the kitchen or on the grill as the farmers treated the animals in the fields. When cooking a grassfed steak, we want to achieve a delicious sear that creates a pleasant, light crust on the exterior of the meat, then allow it to finish cooking at a much lower temperature;this allows the naturally occurring sugars to caramelize on the surface, while protecting those muscle fibers from contracting too quickly. Tough grassfed steaks result from over-exposure to high heat, which causes the muscle fibers to contract tightly and become chewy and overly dry. The technique on the left is taken from my forthcoming cookbook, Long Way on a Little: An Earth Lovers’ Companion for Enjoying Meat, Pinching Pennies and Living Deliciously. Much to my surprise, not every family on the North American continent has access to an outdoor grill—hard to believe! Thus, in an effort to include you in the thrill that comes from eating the besttasting steak available, I’ve included an indoor steak recipe that guarantees your grassfed meat will remain tender and juicy. Enjoy! Either 1 sirloin, sirloin tip, tri-tip, top round or London Broil, rib eye, porterhouse, T-bone, top loin (New York strip) or tenderloin (filet mignon) steak. Steaks should be at least 1¼ – 1½ inches thick. Combine the salt, pepper and garlic in a small bowl. Rub the mixture into both sides of the steak, then allow the meat to come to room temperature. Preheat the oven to 200 degrees, then heat a large cast-iron skillet or other oven-proof skillet over a high flame. Once the skillet is so hot that you can see a little smoke rising off of it, add the butter or fat. Sear the steak for two minutes on each side. Turn off the flame, and insert an instant-read meat thermometer into the boneless edge of the steak—do not insert it into the top, as there is not enough thickness for the thermometer to take an accurate reading. Leaving the steak in the skillet, place it in the oven and allow it to finish cooking, about 10-20 minutes per pound, until the internal temperature reads 120-135 degrees. Allow the meat to rest five minutes before carving and serving. Start the grill and warm it until it is hot. If you are using a gas grill, turn off all but one of the burners once it has come up to temperature. If you are using charcoal, be sure all the coals have been raked to one side. Use the hand test: The grate is hot enough when you can hold your palm 4 inches above the metal for no more than three seconds. Sear the steaks for 2–3 minutes on each side directly over the flame, with the lid down. Then, move the steaks to the part of grill that is not lit. Set the lid in place and allow the steaks to cook, without flipping them, until they reach 120-135 degrees, about 5–7 minutes per pound. 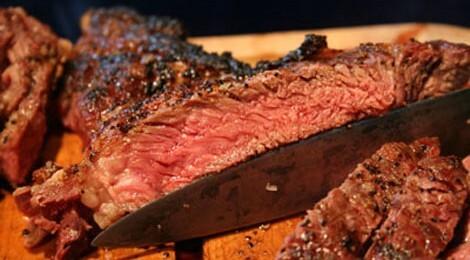 Remove the steaks to a platter and allow them to rest a few minutes before serving.